"I went to Spoleto and I was also on the aqueduct, which at the same time is a bridge between a mountain and the other one. 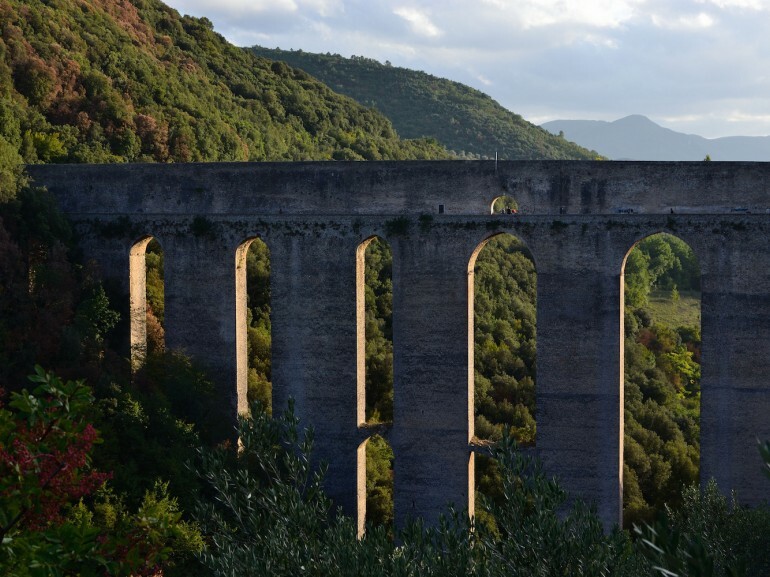 The ten arches overlooking the whole valley, built of bricks, resist safe through the centuries, while the perennial water flows from one side of Spoleto to the other. This is the third work of the ancients that I’ve in front of me and in which I observe the same, always great, footprint. The architectural art of the ancients is truly a second nature that works conforming to the uses and purposes of civilians." 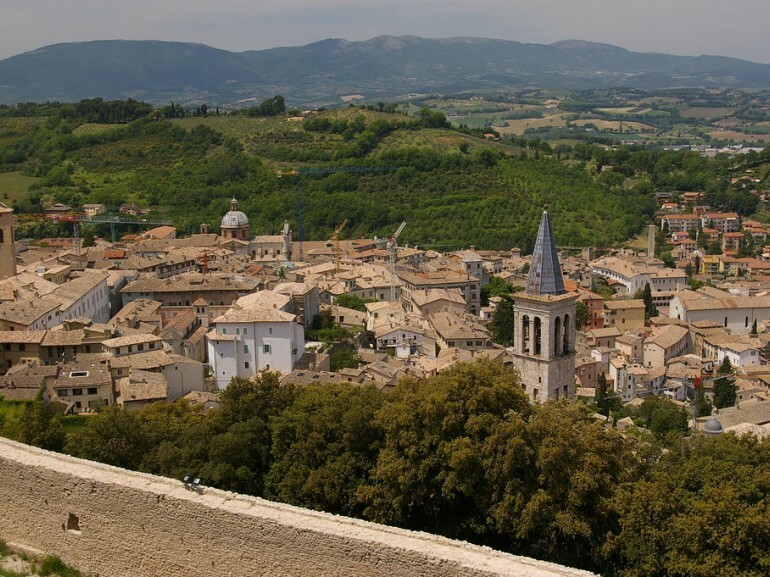 In the Spoleto end of the bridge, you’ll see the Rocca Albornoziana overlooking the entire city. 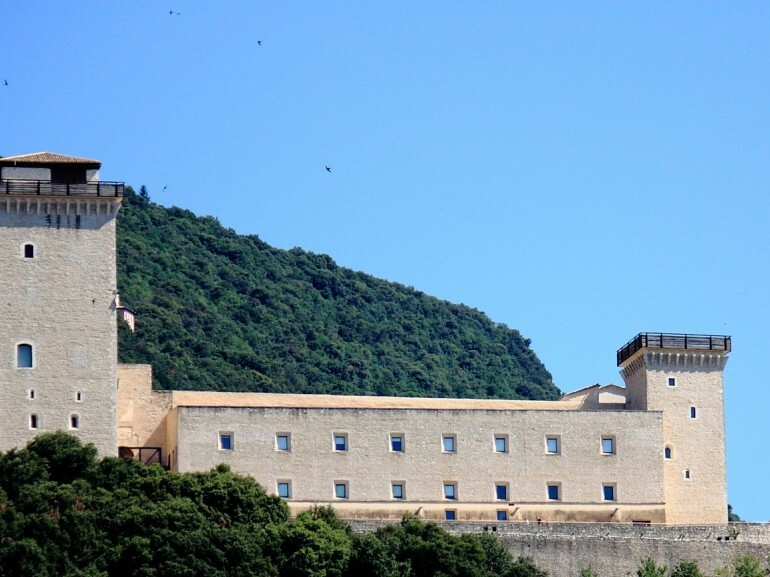 Bordered by a high perimeter wall system with six square towers, it is divided into two areas: the main courtyard, with the National Museum of the Duchy and a space for exhibitions, concerts and conferences, and the Courtyard of weapons, with an outdoor theater. 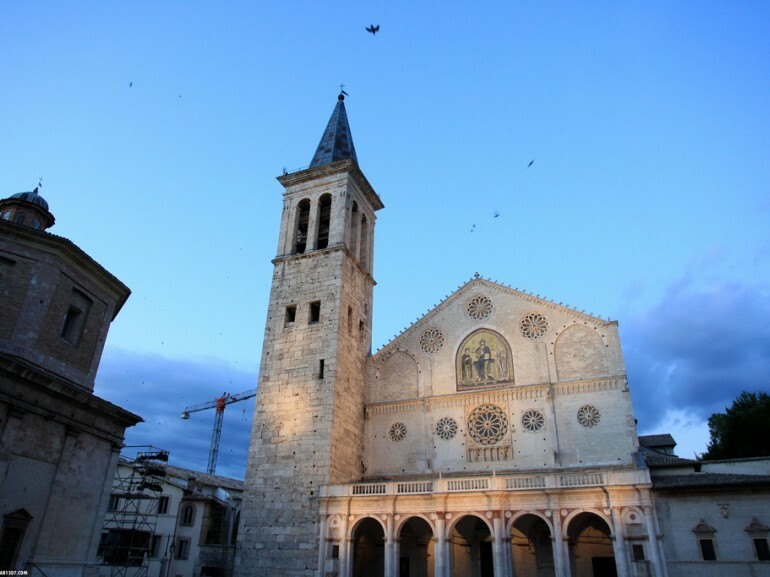 From here you can see the whole city: the Roman theater, the Market Square, the Cathedral of Santa Maria Assunta. To our itinerary we go with our bikes towards Caprareccia, with a fairly strenuous climb of 5km with a vertical drop of 300m. Here starts the path on the old railway Spoleto-Norcia which has now become an exciting path to go by bike or on foot. The path is surrounded by nature and it’s mostly downhill. Among bridges, tunnels (remember the torches!) and viaducts we reach Castel S. Felice. Here we leave the old railway to drive along the Nera River, on dirt roads. The path gives us some nice views of the picturesque Valnerina. After 20km we reach the village of Ferentillo. From here we continue crossing the valley of the river for another 20km until we reach our destination: Cascata delle Marmore (Marmore’s Falls) Here, words are not enough: the show that’s before you is impressive and magical. It is true prodigy of man and nature: a controlled flow that comes down with three jumps for a total of 165m. The waterfall can be accessed in two places: from the Lower Outlook or from the Upper Outlook Belvedere. The first one has the complete picture on the three jumps made by the river Velino throwing into the River Nera. From the second one you can observe better the first jump, with a spectacular view. The two entrances are connected to one and other with one of the five paths in the area of ​​the waterfall (the path 1). We suggest you to take the second path too, a short route suitable for children that will take you into the heart of the waterfall, near the second jump. 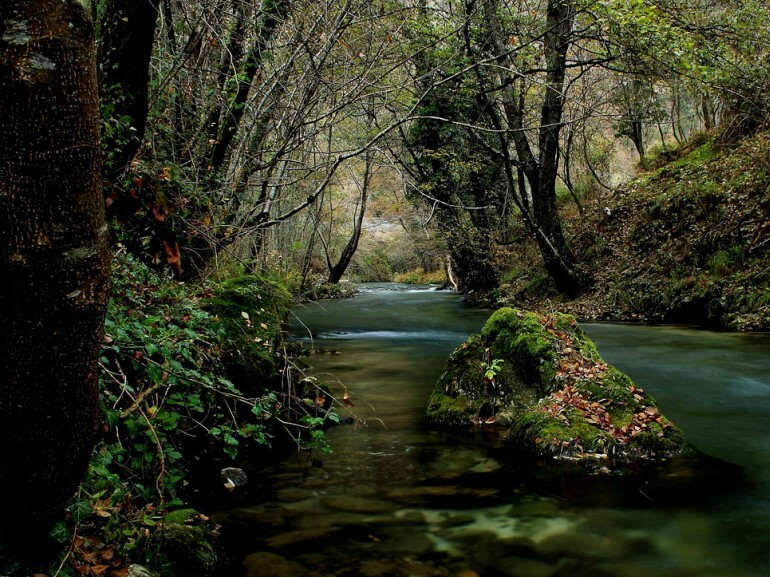 Among ladders and wooden bridges you will feel really in contact with the waterfall and untouched nature. The sound of falling water and the natural caves will give you strong emotions. 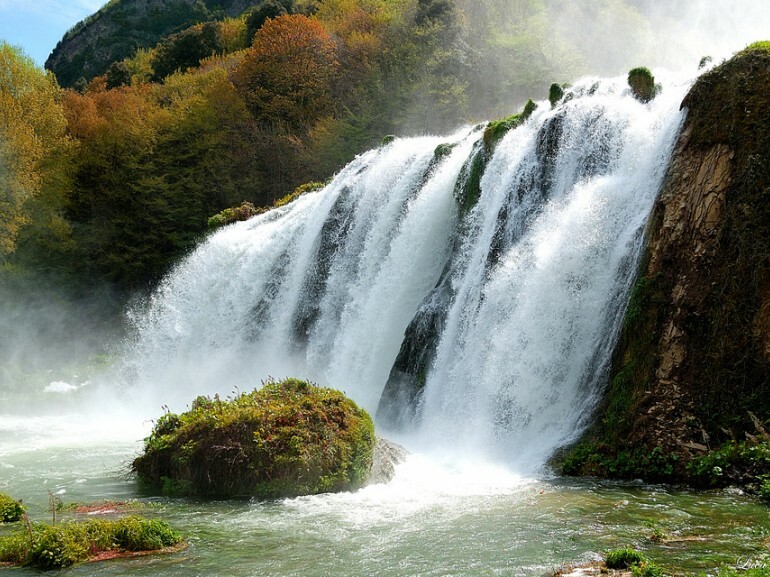 A path immersed in the nature of Umbria, starting from a beautiful village and arriving in one of the most beautiful and magical places of all Italy, the Marmore’s falls.